A comfortable Keke Napep driver, Kelly Murphy has advised Nigerian ladies to stop turning them down, saying that they make even more money than a lot of men in the corporate world. "Why do you girls runaway from us because we drive KEKE, you girls normally see we KEKE drivers as Tout and illitrates, that we don't have dreams apart from driving KEKE, don't you girls know that some of we KEKE drivers are graduates with better grades? 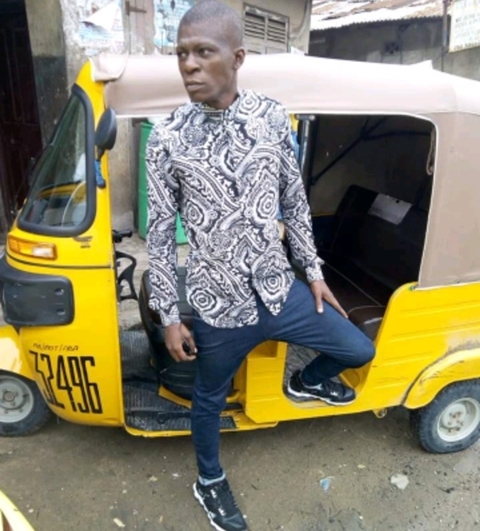 My dear ladies, stop running away from us, driving KEKE is not a bad job, we gain more than 7,000 Naira a day, check it to a month, some of your boyfriends who work in some company or whatever can't withstand us in terms of spending!!!!! STOP SEEING US AS TOUTS PLEASE ACCEPT US, IF WE ASK FOR RELATIONSHIP. NAWAOOOO!!!!!!"